TO your first question, I would recommend starting with trying Influence products (http://www.luckymojo.com/influence.html). You might even consider jut getting the Honey Jar spell kit as it will have all teh instructions and items you need. Your second question is very complex and beyond the scope if this forum. First I would encourage you to connect with mental health provider such as a social worker as it sounds like you have been a through a lot and could benefit by having some help putting things into perspective. Then to know if you have been cursed I would recommend getting a professional reader, one that you trust, to do a divination. We recommend the readers at AIRR (http://www.readersandrootworkers.org) as they sin onto a code of ethics and have been thoroughly vetted. The second printing of Deliverance! 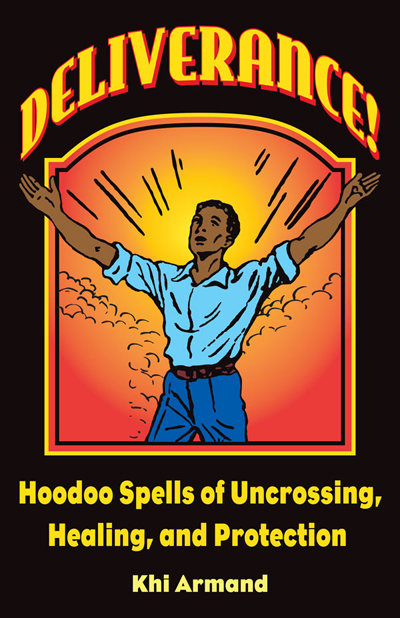 Hoodoo Spells of Uncrossing, Healing, and Protection is now IN STOCK! So i have a little situation on my hands. So my brother has been seeing either a witch or santera or high priestess or something and i went with him the other day wen he asked me 2 go with him. So i went 2 c wat he was getting in2 so that way i knew wat i was up against 2 try and protect myself. B4 i went i put some protection oil fiery wall of protection oil and st michael oil on the bottoms of me feet and up my arms neck face and top of my head with bay leaves in my shoes and some charms and amulets i have for protection. Well i went and the ladies house creeped me out. And he did a spiritual bath there in her home then she looked at me n said sum1 was working on me and that i needed 2 do a big cleansing and she'ld charge me 250 for a cleansing and that ild have 2 let her kno ahead of time bcuz she said it takes time 2 order a dead persons ashes and get graveyard dirt. Now i acted like i didnt kno anything she was talking about but i was like im not lettin lady do anything 4 me. But my actual problem is that she gave my brother a couple of set ups 2 bring home n said she put spirits in them and that he has 2 bring them back every month 2 feed them blood. So thats in my house in his room. So far i have an uncrossing candle a cast off evil candle jinx killer candle and a few other candles i prepared for cleansing i have chinese floor wash ammonia a mix of uncrossing junx killer and cast off evil incense going with camphor i have 13 herb. Ath that im gonna b doin for the next few weeks i i have all the cleansing oils as well and i have bay leaves in each corner of my room and each corner of my alters where the candles are and i also have st michael candle and a protection candle going dressed with herbs and oils. I also have camphor in florida water and water in some of the corners in my home. So im working on the cleansing right now cuz god only knows what attached itslef 2 me wen i was there . But since me n my brother live in the same house and he has those things he brought from her house. What else should i do 2 protect myself against anything that lady put on him? What about protection when you are fundraising? I have lots of ill-wishers with these court cases. Uncrossing candle started last night. My pet has kidney disease and I can't afford tests and new medicines. I cleanse her with sage regularly. I am about to start a gofundme. I haven't done it yet because I'm scared the spiritual backlash might be worse than any benefit derived. I purposely keep my pet photos off of social media and most of my enemies don't even know I have her. Months ago, my gut told me to act like I don't have her to protect her from my enemies. But now I'm in need. If I have to post a fundraiser, how can I best protect her? In recent months, our businesses have been robbed at gunpoint. Today, another one of our businesses was robbed. I am in dire need for protection spells for our employees and our businesses. I should be looking up things myself, but I'm a bit distraught at the moment, as this is causing us some financial difficulties. Some of our businesses are in areas where there are many people who do meth drugs, and I need to find something to protect our property from criminals who steal. I'm glad no one was hurt, but I have to do something to stop this and make our businesses successful. Wow, I am so sorry to hear this! I hope your employees are all safe and unharmed. That is scary. I suggest you purchase the Fiery Wall of Protection spell kit and work one for each business location. Make sure to anoint the windows and doors in the oil as well. Protection Scrub for Home or Business: On Mondays, Wednesdays, and Fridays, get up before dawn without speaking to anyone and wash your doorstep with your own Urine in a bucket of water. When it dries, sprinkle red brick dust across the doorstep. To make the wash stronger, write the Name of the Captain of Police on paper, burn the Name-Paper to ashes, and add the ashes to your scrub water. I hope you and your employees remain safe. Best of luck to you. Thank you Miss Athena. I am going to try all of these... We own eleven businesses, so this is going to take me a while! The employee is okay. The state police were with sniffing dogs, a fingerprinter person, and they walked four miles in both directions looking for the guy who fled on foot. Everyone please send good thoughts on this for me. LOL! Yes, you need to drink up! I'm glad the police are actively pursuing the case and taking matters seriously. Definitely read through the thread I sent you on identifying and catching criminals. It can help you help the police to find who is responsible. It may not be the same person (likely to have been a random hit). Please keep us posted, and you are definitely in my thoughts. Good luck. Help! I am prepping my Fiery Wall of Protection and I am missing a purple candle. Can I still do the spell with 6 purple candles? I would either wait until you have all the purple candles you need, or else substitute a white one if it is an emergency for you to perform the spell now. I have been doing sweetening and reconciliation work on a subject for a while and recently very intensively. All have had very strong, positive results. Anyway! I dreamt last night they found my honey jar and they were shocked and started drawing blue and white crosses before me. I could see cross candles and the subject wouldn't speak to me they were just staring and really scared. I woke up in a massive panic. I'm not after an interpretation because I think this may be a warning for me to be careful. Is there anything recommended I should do? I take weekly purification baths and pouring a hyssop bath as we speak. Would it be worth doing a fiery wall of protection? Hello, I was on the LM Radio Program and took the advice on cleansing with the black walnut bath and removing myself from the evil. It went well, but was short-lived. Last week, I did go through and block several of the bad people people on Facebook (some who I hadn't talked to in eight or nine months) and apparently they aren't taking it well. I've been under attack all week- nightmares and my cat's health suffering. I had a relative check Facebook and now several of the blocked people are getting chummy with my ex, and some have friended him. I have a right to block whoever I want to, whenever I want to (we all do). But I don't like how some start a war against you when you block them- the aftermath has been a big reason as to why I usually try to avoid blocking others. How can I make them all forget about me? Ideally I break up any relationship formed and relationship strengthened between my ex and the others because to hurt me is the ONLY reason they've come together. It may be an indication that you need to work more in secret to avoid being detected. Put bay leaves in your shoes while you work to stay more invisible. I would repeat the spell you were advised to do on the radio show, and perhaps follow it up with a mirror box or reversing spell. You can search the forum for the threads on those subjects (use the search bar in the upper right corner of the page) and find advice on how to construct those spells. Hi. I am looking for some kind of angelic protection. Are there any amulets or mojo bags which are great for protection against demons and evil spirits? And also what oils would you recommend? Hello, my partner is about to embark on a potentially beneficial business venture that is also simultaneously risky. She's essentially planning on quitting a secure job to for greater pay at a position helping someone build a company from the ground up. I want all the best for her and am happy for her, but I can't seem to shake the intuition that it may not work for her. The person who wants to hire her is very successful but idealist and too boot, I just get a bad feeling about him. I want to be supportive of her but also don't want her to hurt herself/her prospects/security. On one hand, she's her own person and should make her own mistakes, but my intuition has served me well and is often spot on about these kinds of things/questionable people. I want to look out for her and makes sure she's not falling into someone else's pipe dream. If I had it my way, I would like to keep this person away. Is there something that could help with that? Hello, I don't know quite where to place this question, hopefully it's in the right section! Could someone please help / direct me on what to do spellwork wise to stop someone asking nosey, prying, personal questions please? Thank you! Welcome to the Lucky Mojo forum. If you'd like to, you're welcome to introduce yourself under the "introductions" thread. I'm sorry you're dealing with someone asking you nosey questions. Beyond telling this person that their questions are inappropriate, you could do a simple freezer spell where you write the person's name five times in a column on a square of torn grocery bag, then cross the names with SHUT UP written five times, wet the paper with a bit of water, sprinkle the paper with crushed Alum, which Lucky Mojo sells, fold the paper three times away from you, put it in a baggie, then throw that baggie in the back of your freezer. If the person continues being nosey and gets aggressive you'll want to take further steps, but this is a good first step. If you go to that page, there is another alum spell you could try. You should also have some general protection up on yourself, which you can find you scroll up through this thread. Thank you so much Sister Jean! I'm ready to do this. Someone tried to break in through my front door- ran away when I turned on porch light. Recently they came back to enter through back door. I suspect my male neighbors next door. I feel like this is happening because I'm a single woman with two children. I put up safety measures like a door camera, ADT, dog, porch lights on. But I need some hoodoo spells/tricks/works to keep this enemy away and for protection. Suggestions greatly appreciated- thank you! First of all, call the POLICE. I have an Ex Friend who was staying with me , who lever stayed their welcome so I asked to leave my home, they must have got a set of keys cut and have since damaged my property and also sent family members upsetting messages about me. Now I've learnt my lesson with personal boundaries etc. And have for fiery wall of protection spell. But I feel I need to get go further and justice revenge. Until now I've only ever used Rootwork for healing, Peotection and Money Magic. Any suggestions or links to where this already has been dealt within within the forum is appreciated. And thank you all who have replied and taken the time to read. First of all, CHANGE YOUR LOCKS. Second, get some extra protection up on yourself and your home (you can scroll through this thread for good ideas). I came here with a question. I am doing spells for about 2 years now and come here often to gain more insight and knowledge. Using LM products mainly for all my work. My question is, how do you (if you do at all), protect your magic work? Are there any protection spells to protect the work you did on someone so they cannot ever find out. I have a feeling my "target" might eventually suspect something and would like to prevent that from happening (I did love spells mainly, for about few months now). I am very careful with everything I do, but my target is quite smart and since started having effects in the way he feels, I am concerned that he might get a reading done or something like that and find out of the work being done on him (since he is quite open-minded and interested in things like tarot, astrology, etc.). What would you suggest? Maybe candle with Fiery Wall oil would do? I'd appreciate any advice really. Thank you Miss Aida, that really helped! Thank you, Miss Aida! Those were very helpful. Hello, I went to make my bed this morning and found a pile of uncooked rice in my sheets. I have no clue where it came from or who would have put it there but it was not me. I'm not sure if this is a trick or symbolic to anything. I'd like to ask if anyone has ever experienced this or knows if this is some kind of rootwork??? In the meantime I am going to burn some sage. I also have LM protection oil and plan on doing some candle work. Although I hope this is not something negative, I feel it's best to protect myself just in case. Any thoughts? And ideas on what other work I need to do? Any help would be gratefully appreciated. Blessings. @jwmcclin thank you! I have searched the internet for the last hour. I think you are right, only thing I found mentioned good luck and good fortune. I'll take that lol! I agree about the protection...this has definitely made me realize that I have been slacking and need to get back in gear. I have work and homework to do! Thanks again for responding. Enjoy your weekend! So I created a product, which is patent pending right now. I want to launch. But am so afraid of a huge company stealing my idea and I don’t have money to pay a lawyer to go after them at this point. Would a protection spell on my product work? At least just for the next 6 months? Yes I think some protection work would help with that, but back it up with any real-world action you can take as well. I’ve stepped up my cleansing and protecting but I have noticed it’s always my protection candles that have black at the top then clear at the bottom. The glass at the bottom of my 14 day candle actually shattered when it had finished burning. Does this mean people are taking “hits” on me? None of my other candles do this. I highly recommend performing additional protection spells alongside your candle spells. Thank you Miss Aida, I will try that and give an update. Quick update: took your advice and my candles have been clean ever since. Thank you! This thread -- the "General Protection Spells Questions and Answers" is not intended to be a dumping ground for people who cannot figure out where to post their current situation or life story. If you came to this thread to ask about the history and practice of protection spells IN GENERAL, then you are at the right thread! Hurray! Those are SPECIFIC protection situations -- and we have almost 60 different topic threads to cover those and other specific protection situations. This is the thread about protection spells in GENERAL. PLEASE, i beg you, as an overworked admin, don't do this to us. PLEASE post your SPECIFIC protection spell questions in one of the 59 other SPECIFIC protection spell topic threads. I almost got in a car accident with my family which would have been disastrous since it was on the highway. But we escaped collision by luck...What could be used specifically for cars and safety on roads? I was thinking of mixing a bunch of protection hetbs, oils and powders in a linen bag and hang it in the car to be seen. I can't hide it since it's not my car so I don't want to call it a mojo. Just a general protection bag...I was thinking of doing a similar thing to hang inside my home by the door and windows to protect it from harm and evil spirits or people. Would this be effective and has anyone done something similar? Any suggestions otherwise? Thanks! How terrifying; we are so glad you and your family are OK! Hello Not sure if this question is in the right thread or not but here goes: So I'm currently staying with a friend of mine temporarily to save money until I can get a room of my own and she's been doing alot of spellwork lately including cursing some people & protection work on herself. My question is this: Will I be affected if the other person sends a curse back her way even though I'm not involved really meaning I don't know the people & haven't done anything to them? I just did an uncrossing spell on myself & a cleansing /protection after about a week ago but now I'm worried that I might get backlash from someone else bc I'm staying here. Any insight is welcome. Thanks so much. I would dress the root and Devil's Shoestring and bag with a 4 ounce blend Im getting of Devil's Shoestring, Rue, Protection and Fiery Wall of Protection oils. Maybe I should add black hen feather's or maybe what I have is solid. Any thoughts or advice would be greatly appreciated. I can't say for sure yes or no whether you will be affected, because that's pretty impossible to know. However, are you at a slight risk? Yes, I would think so. So I would say to keep doing your protection and cleansings, and you should be covered! I think your plan for a mojo bag sounds great. The color is more of a preference thing; I usually make my mojo bags with red bags, and red is very traditional, however if you feel that white is more protective for you, go with that. Only addition I would make is rue. I am from and live in West Africa. I and my family believe 101% that we are under a strong hex/jinx/curse. I recently knew about hoodoo and I have agreed with my brothers that we will do a Spiritual Bath to wash away the hex/jinx/curse. But we are being cautious knowing that whoever did it may still be around and can do it again, this time in a more sinister way. So we want a very potent protection. I am aware of a Saint (forgotten his name) that protects and is said to be very good at it, plus he sends Karma to evil doers. We will also petition him for protection. But we are leaving nothing to chance. We also want a spell/hoodoo working for protection also. Again, our first son lost in USA for very long, we also want to use a saint to find him. But again, we want a spell to protect him so they dont drive him away again, as they did the 1st time we found him and the news spread round. Please recommend very good Protection spells. Also, pray to St. Michael to protect yourself and your family. Okay I don't know how to say this but I've been in this property for a year now During this year I have been very quiet in minding my ps and cues because I'm in a new area andbut now I am I've had literally three arguments over my phone as of recent and now I've noticed that My neighbours neighbour get really loud or say shut up in background or goooooal now how can I be able to express themselves in my own home and not be controlled by environment. Do I have to do the Cleansing Bath with my brothers only or Will our wives also join in? How about our little kids?